When I did my BBQ round-up idea and found this recipe I knew I had to make it. I have seen it everywhere and it looks so amazing and perfect for summer! I was curious to know how a pretzel crust would taste and the result was fantastic! I especially loved the layers in this dessert. The sweet and salty pretzel crust, the cream cheese middle, and the jello strawberry layer on top! Perfection! Everyone loved this salad and it didn’t last long. I am so glad I finally gave this recipe a try because it is a keeper! Delicious sweet and salty pretzel crust with a cream cheese and strawberry layer. This is perfect for summer! Preheat oven to 350 degrees. In a mixing bowl, combine crushed pretzels, sugar, and melted butter. Press into a lightly greased 9x13 pan. Bake for 8 minutes and remove from oven. Let cool completely. Make the jello according to package directions. Mix in the fresh strawberries. Let refrigerate for an hour or so to let it partially set. Beat the cream cheese and sugar together until creamy. Fold in the cool whip. Spread the mixture over the top of the pretzel crust completely to the edges so the jello won't leak through. Pour the jello over the cream cheese layer and refrigerate for 2-3 hours before serving! Strawberry pretzel salad is one of my husband’s summer favorites! I’ll have to make this for him again soon! I’ve been wanting to make a version of this for a while now. I need to get on it…this looks too good. I can’t believe you hadn’t ever tried this salad. it is one of my favorites. A raspberry version is delicious too! This looks incredible! I have to ask, what type of camera do you use? My hubby would go nuts for this Alyssa! YUM! I think pretzel salad is the greatest thing EVER!! This looks so yummy. Can you make this with fresh peaches and peach jello? Oh my goodness! That sounds amazing! I am sure that it would be awesome that way!! Can you freeze this dessert ahead of time? I haven’t made this yet. Do you use sweetened strawberries or unsweetened? Hi Alyssa, can I substitute the cool whip for whipped cream?Thanks. 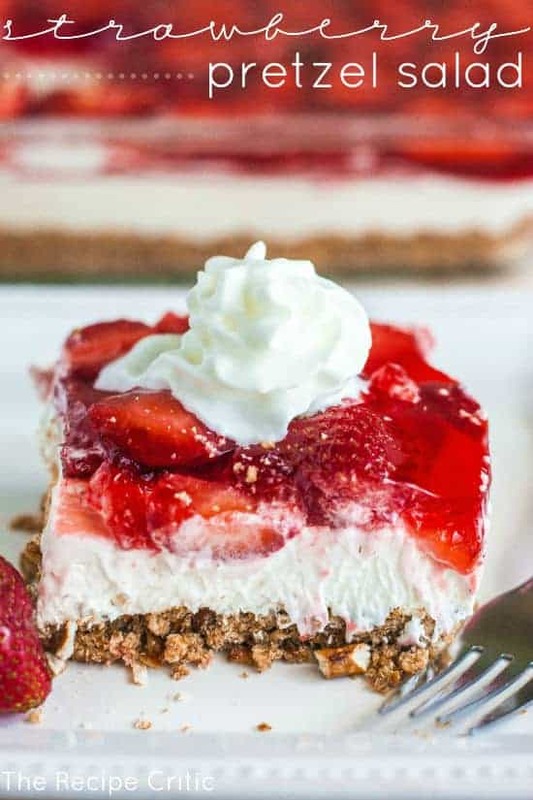 Hi love your receipes want to know if I can freeze this pretzel crusted strawberry dessert? Yes, of course! I have never tried it but I am sure it will taste great if properly stored correctly in the freezer. It may alter the taste and even the texture of the dessert. Since I am obviously recipe illiterate, it would have been nice to know to mix brown sugar with pretzels and butter, but now I now the recipe goes in order and I shouldn’t have had all ingredients out at once. But, it was great! This recipe is great but how can you keep the pretzels crisp? They get soggy so fast!! As soon as I fix it and refrigerate it a few hours the pretzels are soggy! I make sure that absolutely no jello seeps under the cream cheeese/cool whip layer. Help!! I can’t use cool whip, allergic. Could I fold in homemade whipped cream instead? I’m looking forward to preparing this recipe, What brand of pretzel did you use for the bottom crust? There are so many brands and shapes. One cup, I should’ve said. It turned out OK though. When you make the jello, do you add 2 cups boiling water and then 2 more cups cold water ? 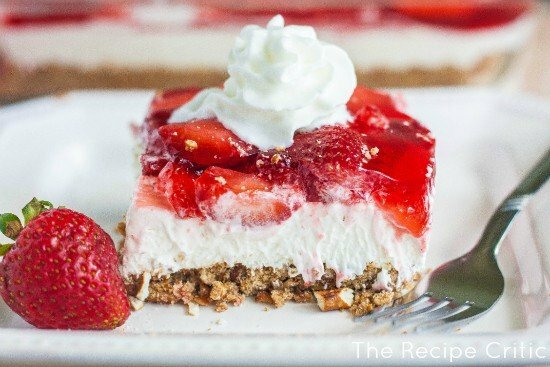 I make this recipe with a pecan crust instead of the pretzels and use pie filling for the strawberries. It’s always a big hit! I’ve had a variation of this where I work, but I do have one question? Can I use dream whip instead of cool whip? Dream whip is a powder that you add to milk and beat until consistency of whip cream I don’t really care for cool whip, it’s ok but prefer real whipped or dream whip. Yes, that will work great! Let me know how you like it!